The UXU Ranch is a historic dude ranch in Shoshone National Forest near Wapiti, Wyoming. The main lodge dates to the late 1920s. The irregular one story log building stands on a concrete and stone foundation. The lodge borrows details from the Old Faithful Inn for the entrance porch and deck. The interior features peeled log finishes. Guest cabins are typically log cabins on stone foundations. You're in great hands with the UXU Ranch wranglers! Our wranglers hand-pick your horse to suite your experience level from beginners to experienced riders and provide as many horse rides as you wish to take. UXU Ranch has a full restaurant and bar on-site. We are open to the public so even if you're just passing by, stop in and have a warm wholesome meal and a cold drink on your way to or from Yellowstone Park! 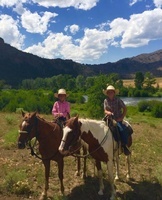 Family owned and operated as a Dude Ranch since 1923. The ranch was listed on the National Register of Historic Places in 2003.